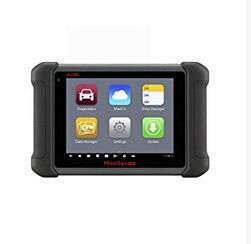 The Autel MaxiSYS MS906 is a state-of-the-art Automotive Diagnostic and Analysis System, and is the next generation version of the massively successful Autel DS708. This scanner allows you to scan for a wide range of problems on cars from over 80 manufacturers, both foreign and domestic, including Mercedes Benz, Audi, BMW, Ford, Chevrolet, and Dodge. The scanner allows you to do a whole lot more than scan your car and diagnose problems. For instance, you can reprogram keys as long as you get the key code from the dealer. It also allows you to reset many systems, from your check engine light to your ABS. Should you want to reprogram certain ECU settings, you are able to do so; however, this feature is only available for certain models. The MaxiSYS MS906 has a wonderful 8.0” LED touch screen display that has a 1024x768P resolution, which is very clear and leaves you no doubt about what you are reading. It runs an Android operating system and can connect to the internet via WiFi to facilitate updates. It can also connect directly to your computer via USB, and comes with 32GB on board memory, meaning you are not going to have to worry about running out of space to save your diagnostic information. The Maxisys comes with its own built in battery, so you do not have to worry about it draining your vehicle’s battery as you use it. This battery is not only used to power the device, but also the 8 mega pixel rear camera that comes with a flash light. This is ideal for taking pictures and uploading them to the web, where an online community of Autel MaxiSYS owners and Autel technicians will be able to help you fix any problem you may have with the system or indeed with your car. Unlike the other products on this list, this is the most professional of them all. In fact, it is so close to the diagnostic tools used by mechanics at major manufacturers that they say it does 85-100% of the work that their machines do. The GUI is clear and concise and you will find it hard to get confused using the system. It comes with AutoVIN technology, which means that it will automatically read and store your vehicle’s VIN number. This is a very useful feature, as many of the car scanner on the market today do not have this feature, and the VIN numbers must either be read via a barcode or manually entered so that the machine can record them. The fact that the MaxiSYS runs on an android operating system allows for multi-tasking, which allows you to carry out multiple tests at once, meaning you can save time on your diagnostics. However, like all systems, it does have a few downsides. For instance, it can take a long time to backup, and though this may not sound like such a major problem, if you are on a deadline, or have urgent work to do, you do not want to be sitting around waiting for your scanner to update information. It also has had a few problems reprogramming keys, especially for some of the European car manufacturers. Jaguar and Ford Europe have been singled out as some of the problem manufacturers. However, only a handful of complaints have been made about this issue, so it should not really be troubling. All in all, this is the perfect tool for any car enthusiast that makes it into our Best Car Diagnostic Tools list. It is great for enthusiasts interested in knowing how their car is running. It is also the perfect tool for technicians and mechanics who want a light, handheld system that is not going to break their banks. Most car diagnostic that carry out almost exactly the same work cost about $10,000. However, this device comes in at a reasonable $1099.00* from Amazon, and for the functions that it can carry out, this is literally a steal.